Join RW In Cambodia For An Adventure Of A Lifetime! 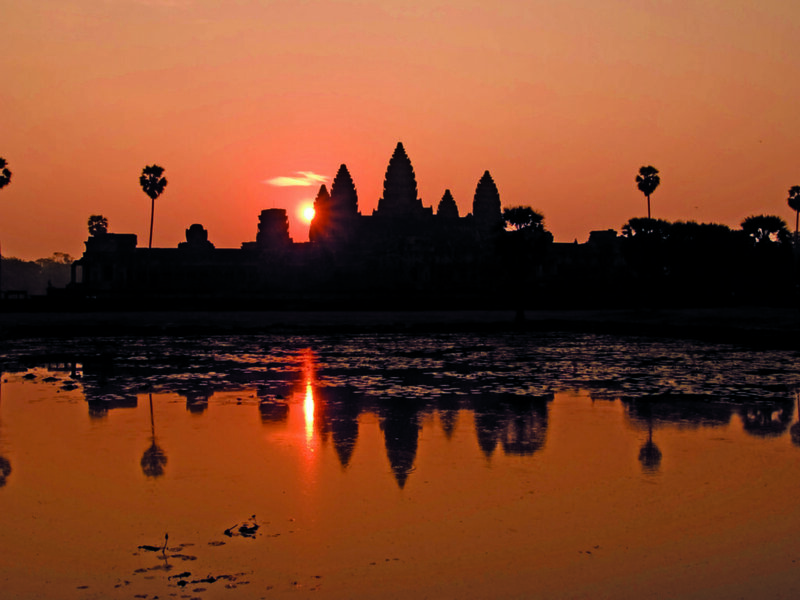 Explore exotic Cambodia with Runner's World and run The Khmer Empire Marathon or Half Marathon! Depart from OR Tambo International Airport on Cathay Pacific flight CX748 @ 12h25. People travelling from outside of Johannesburg will need to get themselves to OR Tambo in time to check in with this flight. There is a 1 hour 45 minute layover at Hong Kong airport. Upon 10h40 arrival at Phnom Penh International Airport, pass through customs and get your luggage. Outside, you will be welcomed by your local English speaking guide who will accompany you to your hotel for check in and free time until dinner. You can grab a tuk-tuk and head to the Russian market where there bargains galore and wonderful handicrafts to be found. 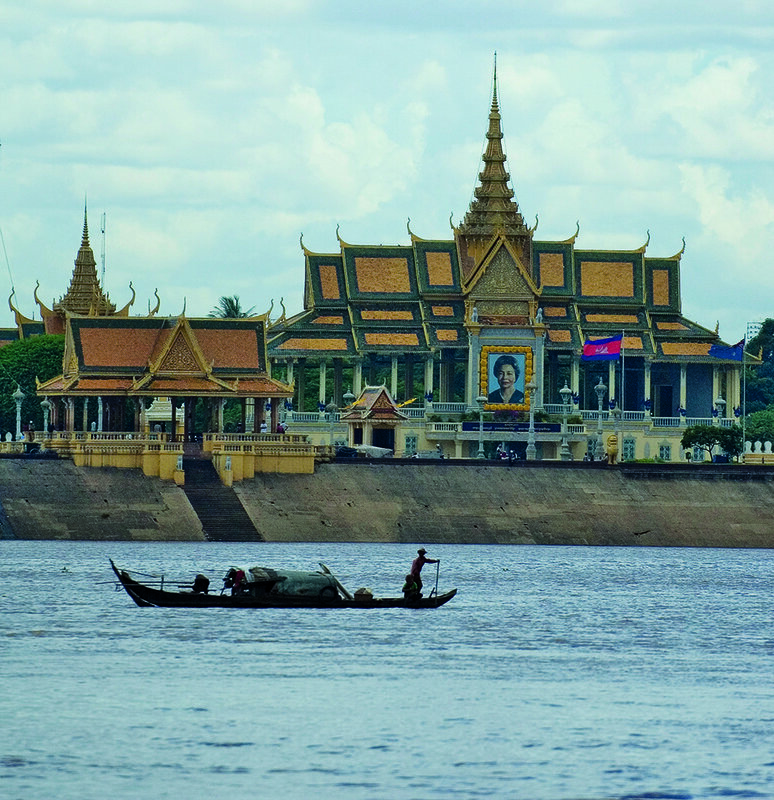 Legend has it that Phnom Penh was founded by Lady Penh, who was gathering firewood along the banks of the river, spied a floating koki tree and fished it from the water. Inside the tree she found four Buddha statues and one of Vishnu. The discovery was taken as a divine blessing, and to some a sign that the Khmer capital was to be brought to Phnom Penh from Angkor. Lady Penh proceeded to build a small mountain to enshrine the statues that still exist today on top of Wat Phnom, one of the attractions we’ll be seeing tomorrow. The capital of Cambodia from 1432 to 1505 and then abandoned for 350 years until 1866, the city is noted for its beautiful and historical architecture and attractions. Phnom Penh was once considered as one of the most beautiful cities in the Orient, and despite its recent turbulent history, it still retains a colonial charm. Cambodia’s capital is a bustling city, majestically located at the confluence of the mighty rivers of the Mekong and Tonlé Sap. Wide tree-lined boulevards and many colonial-era buildings reflect the glorious days and add to the allure of the city, where Asian and Western traditions meet in a fascinating way. At about 4PM, meet your guide and then board a private boat for a late afternoon sunset river cruise along the Phnom Penh riverfront. Afterwards, take a nice stroll for dinner at the famous FCC, or Foreign Correspondents Club, set right on the river near your hotel. Today is a big day. After breakfast meet your English-speaking local guide, tour the city today to discover its ancient and recent past. Take a look into the country’s tragic recent history with a tour of Tuol Sleng Prison (S-21) and the Killing Fields at Choeung Ek, sobering reminders of the evils of the Khmer Rouge regime. Although not a joyful tour, visiting these monuments unlocks keys to understanding the past and present of this developing country. After a tasty lunch continue the tour of the remarkable sights of Phnom Penh in a Cyclo – an original Phnom Penh means of transportation and a fun way to explore this lively city. First, head to the Royal Palace. This palace dates back to 1866 and houses the Silver Pagoda, named for the over 5000 heavy silver tiles that cover its floors. Its original name is Wat Prakeo, meaning Temple of the Emerald Buddha. In this temple you will view a collection of Buddhas in gold, silver, crystal, and bronze. 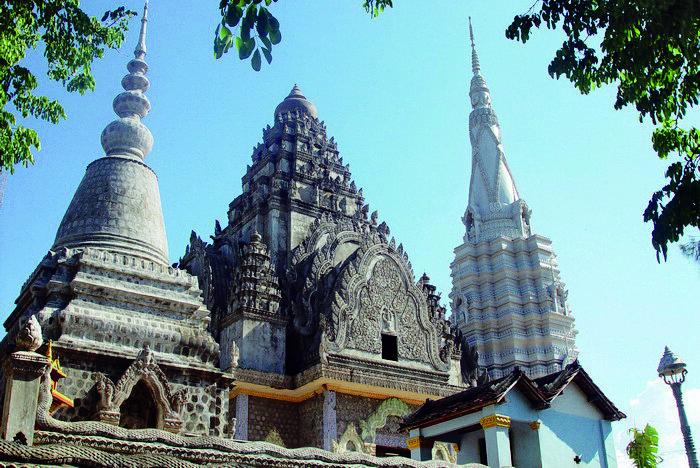 Your next stop is the National Museum, built in traditional Khmer style. It houses the world’s foremost collection of ancient Khmer artistic, archaeological, and religious artifacts from the 4th to the 13th centuries. Over 5,000 pieces are on display, constituting the repository of the Kingdom’s cultural wealth. In addition, the roof space is home to a large bat colony! End today’s journey at the famous Wat Phnom, founded by Lady Penh, whom the capital city is named after. Tonight, you will be treated to a delicious Khmer dinner at Malis, Phnom Penh’s leader in exquisite Khmer fine dining and a delicious way to finish your day. Malis was born out of desire and passion to restore Cambodian cuisine to its former glory and put Cambodia back on the map as a culinary destination. Renowned for its seasonal produce, delicate flavours, and generous hospitality, Master Chef Luu Meng and his team decided to revive Cambodian cuisine from the past, adapt it to the present, and preserve it for the future. Today is another big day. After breakfast, we take a short drive to the famous Central Market to do some shopping. Afterwards, we transfer about 1.5 hours to the town of Skun to enjoy their local delicacy of spiders, a must do for any traveller to the region. Don’t worry, you don’t have to eat them but you can watch as your more adventurous companions give it a try. We then continue about 1.5 hours to the pre-Angkorian temples of Sambor Prei Kuk which had its heyday from 600-900 AD as a part of the pre-Angkorian Chenla Kingdom. Established by King Isanavarman I as the central royal sanctuary and capital, known then as Isanapura, Sambor Prei Kuk is a wonderful example of architecture and religious history. Spend some time trekking around and learning from the guides about this fascinating ancient temple complex which was just officially recognised in 2017 as a UNESCO World Heritage Site. Afterwards we transfer about 1.5 hours to Kampong Kdei and pay a quick visit to the finest example of an Angkorian bridge that is over 800 years old. Afterwards, it’s a short 1 hour journey to Siem Reap. Tonight we’ll have dinner at Phare Café before the entertaining show at Phare Punleu Selpak with the best Class A seating. Known around town as the Cambodian circus, it is anything but. A nonprofit school for the arts, Phare is a demonstration of the graduate students’ acrobatic ability, and it has more in common with Cirque du Soleil with exceptionally talented players acting out anything from Cambodian folklore to the very real history of the Khmer Rouge. It’s a must see for anyone in Siem Reap. Today is the day before the BIG RACE. It will be a relaxing and very special day. Take a trip to Cambodia’s most unique natural feature: The Tonle Sap, Asia’s largest freshwater lake. • Before going, we will quickly stop at the Angkor ticket office and get your passes for the next few days. • Full Marathon, Half Marathon and 10 Km Road Race participants will use the timing Bib tag. The tour today passes through the many small villages that skirt the city of Siem Reap. Enjoy the pleasant atmosphere and the sound of the breeze in the trees. Out here, the children are often eager to practice a little bit of their English. Stop at a local market for a walk-through on the way to Kampong Phluk, just one of many floating villages in the area. Here, the people have learned to adapt to the amazing rise and fall of Tonle Sap (up to 9 metres throughout the year in some areas!) Stop at a local home and enjoy a packed lunch before returning back to where we started. Transfer from the boat docks now to Roluos Group, a series of Pre-Angkor temples about fifteen kilometres east of Siem Reap. These temples display clear differences from the Angkor Complex in their construction and build. But there are many similarities as well that can be recognised in the younger temples at Angkor. In dry season, when the water is too low to traverse by boat, we will instead visit Kampong Kleang or another floating village that is accessible year-round. Afterwards, relax on your own at the hotel until an early dinner where we’ll have a great “carb-filled” meal prior to your big race tomorrow. Be sure and get to bed early and get wake up calls from the hotel. GOOD LUCK! MAKE SOUTH AFRICA PROUD! RACE DAY: Must be at starting line 30 minutes before race. • Trophies and medals for top three overall. Rest of day at leisure. We imagine there will be big parties and fun this evening on Pub Street. Enjoy! Today is fantastic! Set out to explore Angkor Park by traditional tuk-tuk this morning, to see the magnificent temples of Angkor. Arrive for a visit to Ta Prohm temple (a setting of one of the Tomb Raider films), built in the mid-12th to early 13th centuries in dedication to Jayavarman VII’s mother. Ta Prohm is unique in that it has been left largely as it was found: overgrown by jungle, trees and vines, with many parts of the temple crumbling to the ground. 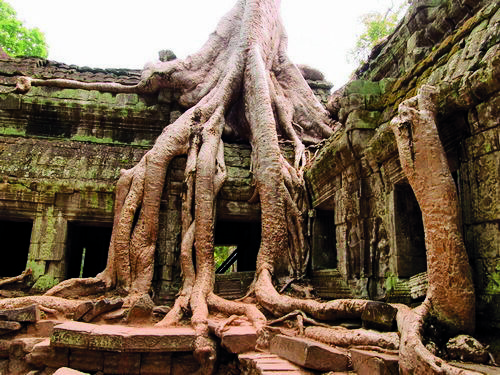 This makes Ta Prohm one of the most picturesque and memorable of the Angkor temples. From Ta Prohm, visit Ta Nei (Grandfather Nei) and Preah Khan (dedicated to Jayavarman VII’s father) before heading to Angkor Thom. This was the last capital of the Great Khmer Empire under the reign of Jayavarman VII. An eight meter high wall draws a perfect square around the city ruin. Enter through the ancient East Gate. On each side of the entrance path a row of fifty-four gods and demons hold the sacred Naga snake of Hindu lore. From the walls of Angkor Thom, head inward for Bayon Temple in the exact centre of the city. This 12th century masterpiece is a study in grandeur and is well-known for its fifty-four towers with enigmatic faces representing the fifty-four provinces of the Great Khmer Empire. The Terrace of the Elephants and the Terrace of the Leper King are also must-visits as they are both known for their intricate bas-reliefs. Southward now, through Angkor Thom to the famous Angkor Wat, the largest religious monument in the world. It was originally constructed as a Hindu temple of god Vishnu gradually transforming into a Buddhist temple toward the end of the 12th century. Built during the reign of King Suryavarman II, Angkor Wat is constructed following the model of the temple mountain symbolizing Mount Meru, the home of the gods. Inside the temple, the walls are covered with stone carvings and bas-reliefs depicting Hindu mythology and the wars Suryavarman II fought during his reign. Angkor Wat is well known for the more than 2,000 Apsara dancers decorating the temple. Construction is thought to have taken around thirty years of intensive labour. Today, Angkor Wat is figured on Cambodia’s national flag as the temple symbolizes the soul of the Khmer people. Tonight enjoy the amazing Apsara Dance Performance and farewell dinner at Raffles Grand Hotel. Enjoy time at leisure this morning before going to the airport for your connecting flight to Phnom Penh to catch onward flight home. You will arrive on Cathay Pacific flight CX 749 @06h35 on Wednesday August 8th. What an incredible journey it has been. • Accommodation as listed above. Ready to book? Of course you are! There are limited places, and bookings close 27 April 2018 so get moving. Contact dave@cambodiaandbeyond.com or visit www.cambodiaandbeyond.com for more information, and we’ll see you in Cambodia!